There is something to be said about looking good! It puts a spring in your step; it makes you feel more self-confident; it is encouragement down to your very core. Meet our special guest Jada Brown, owner of Callie Mae's Hair Design. She is not only a hair-stylist but an encourager, supporter and military-spouse! My business is a family owned and operated business with a home like atmosphere. It has been designed for the clients to visit us and feel as if they are at home and comfortable. 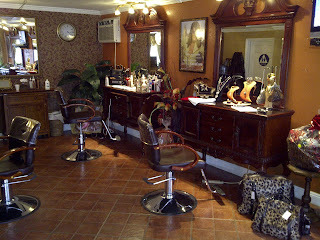 We offer a relaxed professional full service menu specializing in Hair Extensions and Hair Weaving. With over 31 years in the industry we know what a client is looking for and cater to them at an affordable price. Military has helped me to focus on the follow through of a project to completion. I am able to focus and pay attention to detail and how to be attentive to the wants and needs of others. I most enjoy out of my work the before and after of a client that has been serviced in our salon. Many times clients will come in and maybe have a down day; we work to put the self-esteem in the highest position. We offer a $20 discount to all military on any service we provide. We offer encouragement to all of the service men and women of active duty, always lifting up in prayer. Always hold your head up and stand on God’s unchanging words. We are not alone. Nothing ever last forever, soon it will be over and that it is truly an honor to serve our country. If you are stationed at Camp Pendleton near Moreno Valley, California and looking for a hair-stylist, call Marine Corps wife, Jada Brown today: Callie Mae's Hair Design. I'm sure you will start to feel encouragement as soon as you make that call! What did you most enjoy about the military lifestyle and why? I loved the travel, we would not have seen much of the world if we were not in the Military. What lesson as a military-spouse have you gained that has helped you in the business-world? You never say good-bye. You will meet the same wonderful people over and over. What do you most enjoy about your line of work now? Contact with other women. How does your company support the military family? We give 10% off to all Military and Dependants and offer to put Military Maternity clothing on display for consignment. If you could send a message of encouragement to all of our military spouses what would you tell them? That is so difficult because we are each in a different situation. In short, "We love you as much as we do your spouses"
Any last thoughts to share? "Be bold and mighty things will happen." If a picture says a thousand words this one tells me that today's Military Spouse of the Day is someone you can trust! There is something about a genuine smile, knowing that they have stood along side you as a military spouse, and a willingness to help you understand your insurance needs, that makes it easy to say, "You deserve my business". 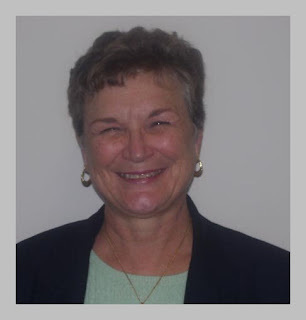 Thank you, Jackie, for your service as a military spouse and your helpfulness towards our military families. Quick description of your business and what you do: I own a Farmers Insurance Agency and we sell all types of personal lines insurance including auto/home/renters/life and small business insurance. We offer multiple policy discounts, plus several others including military discounts. My cell phone is 858-205-7645. My office line is 760-489-8900. My fax number is 760-489-8988. What Branch of Service did your spouse serve in and when: He is currently serving in the U.S Navy and has served for over 17 years. What was your favorite place to live and why? San Diego, California. It's a beautiful place and it is very military friendly. Most places offer tons of military discounts which is great, especially on a budget. The weather is gorgeous and there is always something to do whether it is on base or off. What lesson as a military-spouse have you gained that has helped you in the business-world? I think the best lesson that I have learned is to be flexible. You never know what is going to happen in work and at home. Murphy's law always seems to show how true it is, especially when my sailor is gone. I think most spouses realize this. But it goes to the business world as well. It helps me understand my clients needs more. They are people first and foremost and you never know how bad or how good their day is going or what's going on in their life at that moment. So to just take a couple of minutes and talk to them and understand them. It's really important. What do you most enjoy about your line of work now? I love being able to help families. Most people don't know what insurance means or what its for, they just know they have to have it. Explaining to them why it is important for their family and really educating them and finding out what their needs are is really important. Plus, I really love talking to people and getting to know them and this is probably the best line of work to do that in. I get to talk to people all day. How does your company support the military family? We support military families by providing support, consultation and free advice on their insurance needs. A lot of military families are transplants to California and they don't know all the laws, we are here to help them and answer any questions that they might have. We also have military discounts and are able to work around the military pay schedule. If you could send a message of encouragement to all of our military spouses what would you tell them? We support you and there are countless of other people that support you as well. I know that sometimes it seems like you are all alone and that's a really hard thought to have. But the truth is you aren't alone. All you really need to do is just reach out, whether that is to a friend, your journal, a neighbor, your insurance agent, etc. we are here to help you and to support you. Any last thoughts to share? I just want to say that I'm very proud to be a military wife. It isn't easy and there are countless nights where I wish he was home, but when I think of what my spouse is doing and what it is that his job stands for, I realize that my sacrifice isn't half as big as his is. Without our military men and women, the United States wouldn't be as wonderful a place as it is. May God Bless our Troops and bring them home safely And may God bless their families at home. If you are stationed near San Diego Naval Base take the time to learn about your insurance needs! Meet with Navy Spouse, Jackie: Jackie Diaz Insurance Agency. She has been a proud MilitaryAvenue Partner for over two years. Description of your business: HB Bakery Connection nationwide cake delivery service, was established in April 1987, (August 1997: I acquired the “wire-a-cake” name and joined the internet revolution) Debora George is the founder and president of HB Inc. She developed the idea for this telecake service after an unsuccessful attempt to have a cake delivered to her father for his birthday. Recognizing the potential and opportunity for a successful business, she created a network of bakeries that would give well-wishers a way to "Wire A Cake" to any city in the country. The bakers joined the network to accept cake orders and deliver them in their own cities. But with the slowing economy she faced a decision: reinvent the company or shut it down. She chose to reinvent. What began as an idea to mail a single cake to her dad for his birthday, turned into a business that would send thousands in the US and across the world to the front lines. How does your company support the military family? People assume I am military and I answer no I am not BUT my cakes are! After 9/11 people were asking if I would send a cake overseas to the military and my response was always “No I did not think it was possible to ship a traditional frosted, decorated birthday cake so far away and expect it to arrive in decent condition”. 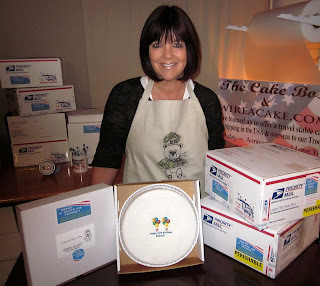 In 2008, the slowing economy was a factor in reinventing and shifting the focus of the telecake business from the bakery network to an association with a sole bakery here in Huntington Beach, CA that could come up with a travel stable cake. After many test cakes to a few brave marines we came up with a winner. The military order is a gamble to accept from a business standpoint as the shipping is out of ours & USPS control once it is in military hands but the joy that comes with a successful delivery is more than worth the risk. We do not recommend sending our treats if the mail takes longer than 2 weeks to arrive and families are understanding of that. When cakes get misdirected, delayed and arrive spoiled or sometimes never even arrive we stand behind the integrity of our company and we gladly replace the cake. There is a war going on and the circumstances are such that many companies refuse to even ship to an APO because the risk is too high. Thinking about all of the cakes and goodies you have sent overseas, what made you start that line of your business? If it was not for the many requests I received I don’t think I would have come up with the idea to try and ship a cake. I am aware of a few companies that do ship to APOs but it is a smaller different type of cake i.e. brownie/coffee cake or cake in a jar. Ours is the most like a traditional birthday cake complete with personal inscription on the cake and a candle for a birthday or anniversary celebration! "The cake was great...to be honest, I didn't think a cake could be shipped and actually not go bad but your cake was still moist and yummy. The fondant was really good..I'm a fan of good fondant. Thank you very much once again. 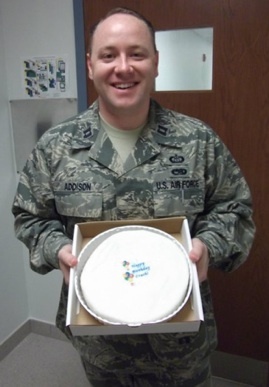 Capt Addison, United States Air Force"
What is the best thing about your line of business? I know that sending packages is an expression of love and support whether the address is here in the USA or thousands of miles away to a military address. We have sent thousands of cakes and each one that is sent is the most important cake being sent. In the beginning I was always so anxious wondering if the cake made it to it’s destination in one piece but in this business I have found that no news is good news. We do encourage any feedback positive or negative as that has helped us make necessary changes and improvements for the better. If you could send a message of encouragement to all of our military families what would you tell them? Thank you for your and your family’s service and sacrifice to our country for our freedoms. Any last thoughts to share? We are proud to be a member of the Angel Team of Bakers for Soldiers' Angels Organization. Each month we take on an assignment and send a cake, cookies or pie to a deserving service member. Quick description of your business: We are a grassroots, non-partisan, non-profit organization dedicated to outreaching to the community. Support Our Arthritic Kids is a non-partisan and non-profit organization whose primary goals are 1) to engage in education, awareness and provide support to patients, children, parents, and community leaders; 2) to inform the public through outreach programs, health fairs, brochures, pamphlets and other educational materials; 3) to outreach to the communities with little to no health insurance to make sure that those "aches and pains" that children have are not the onset of Juvenile Arthritis. What do you most enjoy about the military lifestyle and why? I enjoy traveling and meeting new people! I really don't mind moving so much. What lesson as a military-spouse have you gained that has helped you in the business-world? Networking is a key business tool, you never know who you are going to meet and will be able to help you in the long run. What do you most enjoy about your line of work now? From all the knowledge I have learned about this illness that has affected my daugter, I am able to help other parents, civilian and military, understand what it is and how it affects their children. I know this happened to my daugter a month after my husband deployed for the 4th time, so that entire year was hard but we made it through. How does your company support the military family? We provide support groups to military families, workshops, and eventually we are going to offer scholarships to families who can't afford the medicines. If you could send a message of encouragement to all of our military spouses what would you tell them? Don't give up, I know sometimes things look rough but we are the most resilient group of spouses out there, Military Spouses. We can endure anything that is put on our plates. Any last thoughts to share? Always stick together. You can learn more about Support Our Arthritic Kids Inc at MilitaryAvenue.com: MilitaryAvenue Partner Ad. You can also join them on Facebook. What was your favorite place to live and why? Poulsbo, WA (while husband is stationed at Bangor). Beautiful climate - although the winters are rainy and dark. Topography also has great hills, which are a good challenge for runners, like me. Beautiful views of Puget Sound and various mountain ranges. What lesson as a military-spouse have you gained that has helped you in the business-world? Taking what comes, and not sweating the small stuff. What do you most enjoy about your line of work now? Helping women have something positive to do for themselves, and helping women recognize that they are beautiful and strong. How does your company support the military family? Military and dependent discount, contributions of gift certificates to various military fundraisers, and providing another female-based community for wives. If you could send a message of encouragement to all of our military spouses what would you tell them? While the time apart from our husbands (or wives) are hard, the time that we get with them makes all of the challenges worthwhile. Any last thoughts to share? Thank you to all of our service members and their support systems! 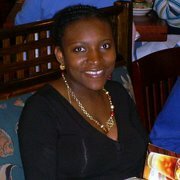 Military Spouses do a lot of entertaining and Air Force wife, Rachel Ayodeji, knows the importance of impression! Beautiful linens, awe-inspiring floral, unique balloon designs. It is all part of her package! Whether you are planning your wedding in the DC area or are planning a spouse-function and need some help setting the stage, give Rachel of MFP Events Service a call! 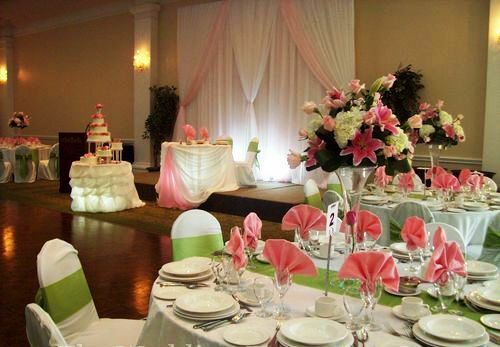 Quick description of your business: MFP Events is a special design studio providing linen rentals and inspired floral and balloon décor for weddings, parties, and other social occasions in the D.C. Metropolitan area. Our custom floral and unique balloon designs are sure to bring added beauty to your big day. Our obsession is providing our clients with elegant florals and decor to make their events stylish. Trying to impress your guests? Our Unique fresh fruit displays also add the wow factor to your event. What is the best way to reach you? : By phone, email and by appointment. What do you most enjoy about the military lifestyle and why? I love meeting new people and there are endless possibilities. What lesson as a military-spouse have you gained that has helped you in the business-world? Remaining positive at all times has been a sanity-saving endeavor. This keeps me going in my event business because it can get really busy for me and dealing with my clientele requires professionalism and putting up with a lot of attitudes. 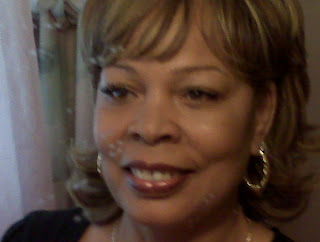 Staying calm and collected helps me in dealing with all kinds of clients and it is all part of good customer service. How does your company support the military family? We know what it's like to be a military family and we understand budget needs of military homes. We offer military discounts and coupons for our decor packages and event rentals. We also offer special discounts to our young Airmen out there planning to tie the knot. If you could send a message of encouragement to all of our military spouses what would you tell them? l'd say hold on strongly to God for strength. Wivesoffaith.org is a good resource for support and encouragement. Communicate more with family and friends. I know that those with very young kids stay busy enough. Picking up new hobbies or classes helps time go by faster. Any last thoughts to share? We are dedicated to making every event a stylish and unforgettable affair. Contact MFP events services for your next special occasion and discover our affordable, memorable and truly elegant decor! We are excited to kick off our Military Spouse Appreciation Spotlight! 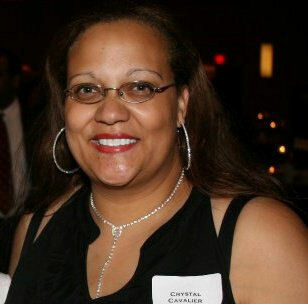 Our first special guest is Regina Bryant, a military-widow who lives close to Robins AFB in Georgia. She is a great reminder that spouses come from all walks of life. Active Duty, National Guard and Reserves, Retired and Widowed. We hope you enjoy getting to know Regina and look forward to more spotlights throughout the month! What lesson as a military-spouse have you gained that has helped you in the business-world? Being separated from a loved one is very difficult. A military spouse has to manage the needs of his or her children and financial responsibilities while the active duty spouse is away. Knowing this has helped me to understand the needs of most of my clients since they are mostly military. Helping to make their moves as smooth, and as stress-free as possible, is my main goal. What do you most enjoy about your line of work now? I enjoy meeting new families (friends) and helping them to find a home that meets their needs. How does your company support the military family? We provide clean, well-maintained properties at a decent price. If you could send a message of encouragement to all of our military spouses what would you tell them? No matter what is required of you, you can do it. You have the stamina and the moxie to meet all that is thrown at you with your head held high! Any last thoughts to share? A military spouse is only limited by the limitations placed on herself/himself. I have owned three companies and have a master degree. If I can do it, so can you. If you are in the market near Robins AFB, Warner Robins, Georgia, come get to know Regina and her business: Century 21 Williams Realty. She has been a proud MilitaryAvenue Partner for over two years. What are you going to do for our behind the scenes military-spouses; the wives and husbands of our soldiers, sailors, airmen, marines and coast guard? Get your community involved. Perhaps a community day down 'central avenue'. Flowers for military spouses, massages, manicures, free-planners. Each participating store could have their own 'give-away'. These ladies (and men!) need the pampering! Do you need more ideas? Read '101 Ways to Thank a Military Spouse'. Quite a few ideas are business oriented, all of them are spouse-centered. Let us know what you are going to do! We want to let the military-community know that the businesses outside the gates genuinely care! Become a military-partner and make this special event a part of your 'Reward', or military-discount. 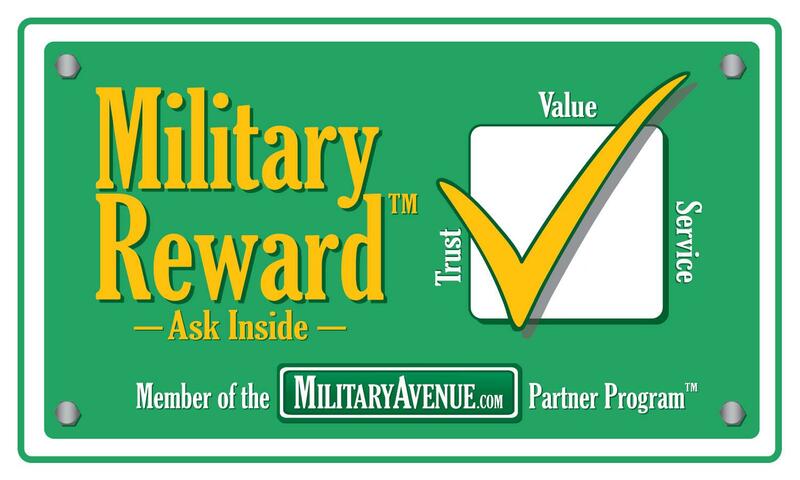 If you are a partner UPDATE your Reward to include the Military Spouse. Do this before May 1st and it will be a part of Military-Alerts. Your Event. Their email box. Talk about some great publicity! Some of us are Army-strong, others of us are in the Air Force-blue, there are a few proud Marines, a wealth of Navy and the ever-vigilant Coast Guard. We love our soldiers, sailors, airmen, marines, and coasties. Most of us don't wear the uniform but all of us swoon (deeper than a civilian can understand) when we see the uniform. We keep the home-fire lit and our babies at bay. We manage the home-front with grace and ease mixed with a few fumbles and a bit of heartache. We may not be "issued" but we are chosen! We depend on friends, mentors, networks and far away family to get us through the tough times. We use strength to carry us. Distance to mold us. Tears to soften us. Laughter to brighten us. Perseverance to humble us. Reach out today to your military-spouse community! Start planning an event they won't forget! You won't regret it. You are the community that can support our military-members and their children. As a MilitaryAvenue Partner we know that you hold the military family in high-regard. 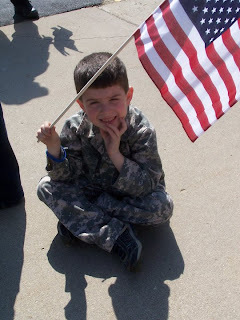 So what can you do to help the military child? Get to know them, collectively and individually. The National Military Family Association has created a great tool-kit that you can download for free. It has some fabulous tips that they devised by talking to military-kids. I think you will glean a lot of great information from it that you can apply to helping your military community: "Military Kids Tool-Kit"
"LIFT invites links from everyone--military family members of service members or veterans, service members and veterans themselves, and anyone else who wants to "show the love" to military families. "This is by no means confined to the military community," Tsetsi says. "In fact, I hope the links we receive from those with no military connection greatly surpass what we receive from people who know someone in the military. After all, 'everyone else' is 99% of the population. What a powerful message that would send." Perhaps you could involve your customers by sending the idea out in a business to customer newsletter. Or, better yet, if you have a waiting area set all the supplies needed for waiting-customers. You can collect the links and send them all at once. (Contact information can be found here: http://likeitfortime.com/lift-link-love/) Involve your own children or community group. This is an easy way to say, "We stand behind the Military Family".